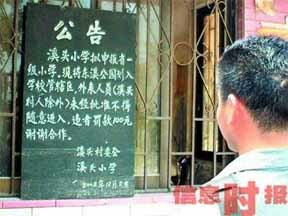 There is a Peking Duck post (and the follow-up) about the authenticity of a sign that says "No Dogs Or Chinese Allowed" at the entrance of a park in foreign-leased-territory in Shanghai. That issue has been beaten to death without a definitive answer as to whether such a sign really existed. Hearsay doesn't count and unauthenticated photographs don't count. What is required is a dated photograph of such a sign published in the 1910's/1920's, and that has not yet emerged. But it is not the purpose of this post to deal with that piece of history. 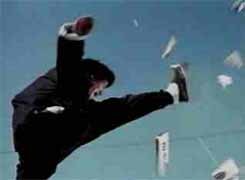 As far as I am concerned, the case is closed -- since Bruce Lee included such a scene in his movie Fists Of Fury (also sometimes known as The Chinese Connection) the entire Third World already believes this to be true! And we live in a globalized democracy and the majority rules! Here is the sign and Bruce kicking it to smithereens! See, it is true! (Nanfang Metropolitan News via Tom.com) By Xu Linuo. May 8, 2005. "Notice: All unauthorized Chinese and dogs are not permitted to enter, or else you are responsible for all the consequences. May 1". 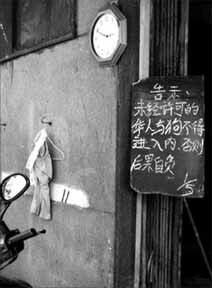 This unsigned notice was written with a chalk pen on a small blackboard hung on the gate of a factory on Yuannan Street in Lihuan District. When the reporter went there yesterday, the old factory building appears to be empty with no sign of production activities. On the outside were two stone tablets which said "Guanzhou Bicycle Axel Cover Factory" and "Guangzhou City Wuyang Bicycle Enterprises Sports Equipment Factory." When the reporter entered the factory, she observed several males and females watching television or sleeping. Periodically, someone comes out pushing a bicycle. A female who claimed to be from Henan province told the reporter that she had been hired by the "boss" to look after this factory building to make sure that no one steals anything. She has no idea who the "boss" is as she has never seen him/her before. The female said that she had no idea who wrote those words on the little blackboard. The reporter asked, "Don't you feel that these words insult people?" The men and women by the door laughed and said it was good fun. When the reporter pursued the question further, the female said, "This way, it will stop strangers from barging into the factory." There was a row of motorcycles lined up outside the factory wall. So this was an open-air parking lot. While the reporter was asking questions, a man came over and took the blackboard down. The man claimed to be with the parking lot. He said, "These words were written by children." The reporter asked, "Why did you hang the words out?" But he turned around to asked the reporter, "If I want to enter your home now, would you let me in?" 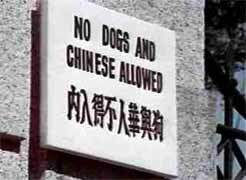 The reporter asked again, "Little children don't know enough and so they write 'Chinese and dogs not allowed in.' But when the adults see that, shouldn't they lecture the children?" The man claimed, "It is the freedom of speech to write whatever you want." About this notice, a lawyer said that freedom has to be balanced against rights. When a citizen exercise the freedom of speech, it must be legal and not discriminatory and insulting so as to infringe on the rights of others. This notice was intended to protect property, but it cannot be directed against a specific group nor equate that group of people with animals. The above case might be taken as something of a joke. If the reporter had a real wicked sense of humor, she should have sent a foreigner in there and then watch what happens. "But your sign says I can come and go as I please ..."
In the following, I am going to offer some more similar case studies to test your sense of humor. You may not be amused. I am sure that there are many more examples, as there must be plenty of idiots in this world, inside and outside China. (China.com, May 7, 2004) Dongguan City, Guangdong Province. Public notice at a park: "Xitou Elementary School has applied to become a Level One Provincial Elementary School. Consequently, Dongxi Park will be administered by the school. All outsiders (except for residents of Xitou Village) may not enter without permission. 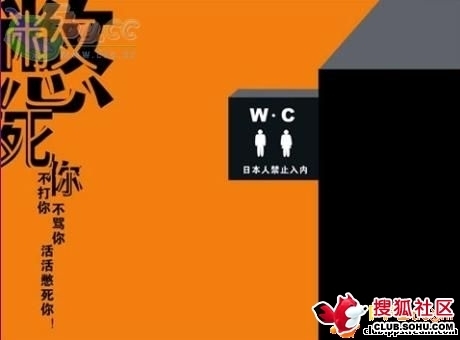 Offenders will be fined 100 yuan. Thank you for your cooperation." The explanation of the Xitou Party Committee was that the park was built with village money, and the students have to go through the park often. When the park was open to everyone, it was full of couples making out or prostitutes looking for clients, and this had a bad influence on the school children. After being contacted by the newspapers, the Xitou Party Committee said that the sign will be taken down. 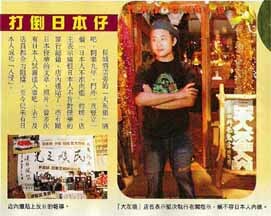 In the late December 2004 edition of Hong Kong's Next Magazine, there is a special section about Shenzhen. It is estimated that Hong Kong people will make about 3 million visits to Shenzhen over the Christmas holidays. 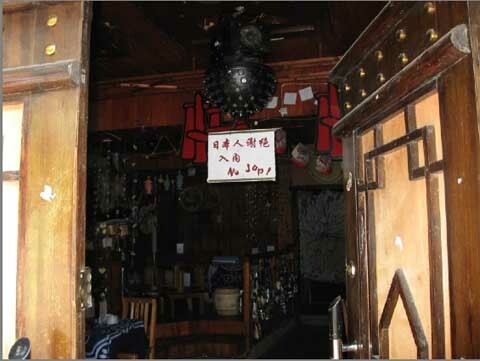 Among the places that some might go is the Great Gray Wolf bar, next to the Great Wall Hotel. The sign on the bottom right reads: "Japanese people not allowed to enter." The text explains that the bar has been opened for nine years, and this sign has always been there. The bar owner says that he hates the Japanese for never having apologized for the war crimes that they committed when they invaded China. Inside the bar, there are articles and photos about the Japanese invasion of China (see photo on the left). The bar owner said that Japanese people have attempted to enter the bar many times, but the owner and the workers have always stopped them so that no Japanese person has ever successfully 'invaded' this bar. 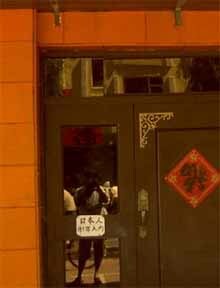 (yninfo.com, September 23, 2004) Recently, it was came to the notice of the Commerce Department in Panyu, Guangdong that a certain coffee house had the sign "This shop only receives Japanese persons" written in Japanese. When our reporter got there, he found a Japanese sign that said: "Japanese Karaoke Club" and then in Chinese, "Open for business between 7pm and midnight." According to local residents, when they attempt to enter, the staff would tell them that the coffee shop only serves Japanese customers. 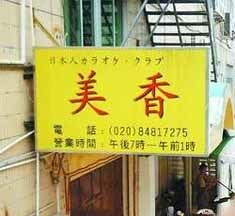 The reporter called the listed telephone number and asked if the shop only served Japanese customers. 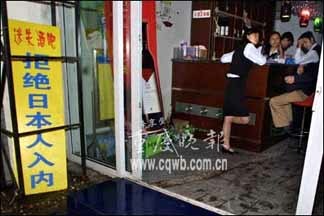 The staff said that the shop had no beverage or music suitable for Chinese customers. If Chinese customers come in, they may not be satisfied. But if they come with Japanese clients, then they are quite welcome. This one is peculiar, since it is not totally discriminatory. 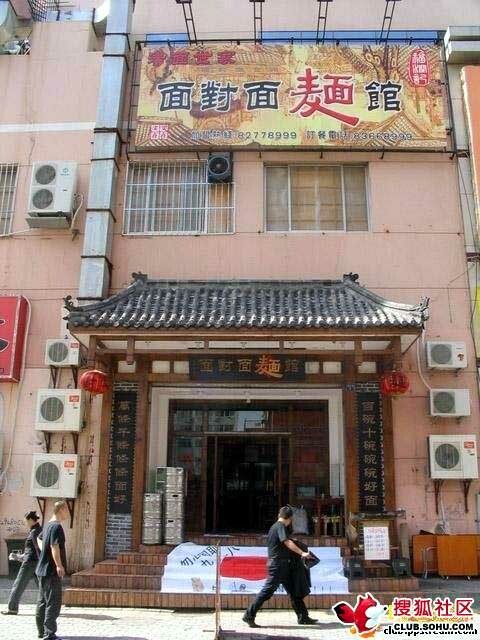 A Chinese passerby will only recognize the shop name ("Beautiful and Fragrant"), the telephone number and the business hours. There is no description of the nature of the business in Chinese. 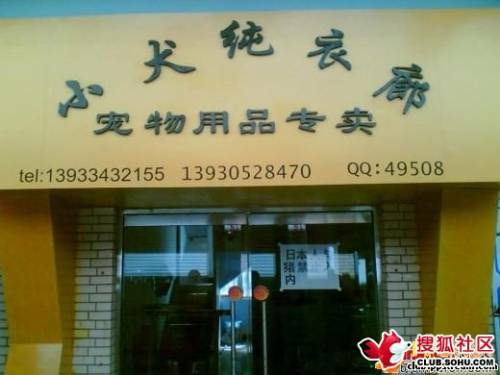 A Chinese person could not tell if this is a coffee shop, karaoke bar, perfume shop or whatever. This shop is not interested in attracting non-Japanese-reading people to come in. As such, it did not offend everyone (whether they are potential customers or not) in the sense of a "No Dogs Or Chinese Allowed" sign written in Chinese. For example, what if a Guangzhou store puts out a sign that says "Boulangerie" with no other explanation? Is that discriminatory? (NewsQQ.com) Yesterday, our reporter went to this furniture store in Zhengbian Road South in Zhengzhou City. There was a sign outside that said: "Notice: This furniture store sells fine furniture for successful people. 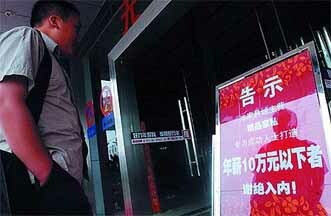 No admission to anyone making less than 100,000 yuan per year." Our reporter stood outside and watched people going in continuously, but there wasn't anyone checking their economic status. The reporter went in and looked around. The furniture pieces were quite expensive, including a 16,800 yuan bed, a 20,000 plus yuan sofa but also some pieces that costs around 1,000 yuan. The assistant manager explained to the reporter that this is a high-end store and the purpose of the notice is to advertise the price/quality levels. The managing director called the reporter later to say that his workers misunderstood his original intent. He had said that he intended to establish the store as a high-end store, but then the store was seeing boisterous and poorly dressed people hanging around, some of whom even urinated on the floor. So the workers misunderstood his intent, and hung out this sign. He said that he has ordered the sign to be taken down. 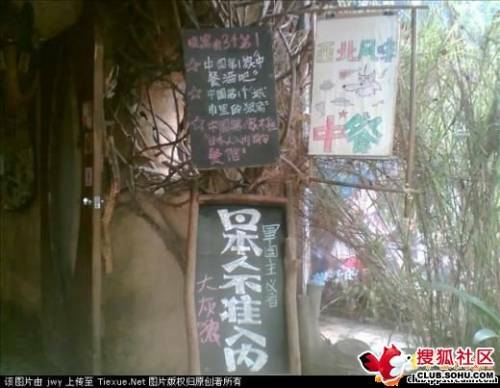 (Chongqing Evening News via gb.chinabroadcast.cn) A bar in Chongqing, China. 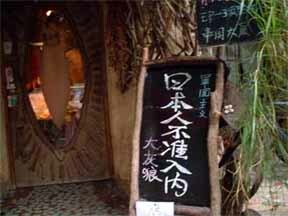 The sign in yellow reads: "The Lost Bar: We Refuse To Admit Japanese Inside." 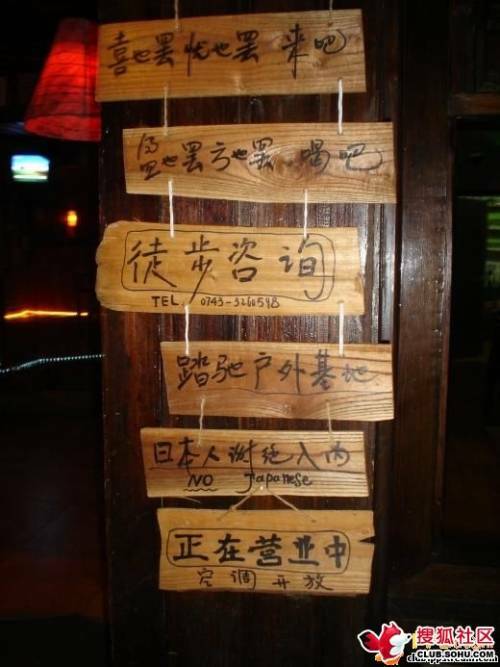 (6Park) In the city of Jilin, a western-food restaurant has a Chinese-language sign outside the door: "Japanese must apologize before entering." 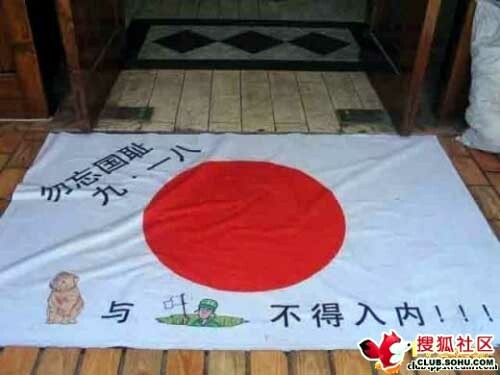 The restaurant said that if Japanese customers want to dine here, they must properly apologize for the fact that Japan invaded China, or else the restaurant will not offer any services. The owner said, "We welcome those Japanese customers who look at their national history correctly, and our restaurant will certainly offer them our excellent services. But we do not welcome those customers who refuse to regard their history properly." (Xinwenhuabao via Yahoo! 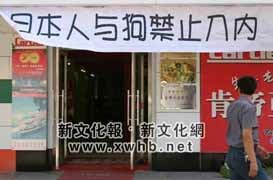 News) On September 18, the national day of infamy, a certain flooring sales store in Changchun, China, raised a banner that said: "Japanese and dogs not allowed inside." Reviews were mixed. A man walking with his 6-year-old daughter said: "While we should remember the day of infamy, this is not the right way. It is exaggerated and misdirected. Not only does it fail to exhibit patriotism, it actually makes people uncomfortable with this extremely narrow-minded emotionalism." The manager said that this was the ninth year in which he had done this on 9/18. "I am not exaggerating even if I am somewhat extreme. But this is how the warning message gets through better. This generation must not forget and the next generation must not either, or else their suffering may be even worse. My hometown is Dunhua. Last summer, two Dunhua children were burned by chemical gas bombs left behind by the Japanese army." 第一眼讀到這篇文章, 就有衝動把裡面引的史料重排一次來看. 史料從1903到1927年. 前後20幾年, 還不到一代人. 注意那20幾年間的變化. 公園的禁例一直在放寬, 最少字眼不斷地變得客氣. 似乎到了20年代初, 雖然成文的規則沒有改, 公園遏抑的只是華人形像在公園出現. 再過三幾年, 似乎公園連這政策也放棄了, 只剩下外國人的排拒目光. 1903年還是光緒年, 27年已經是民國16年. 但我並不認為這些變化, 跟推翻清朝建立民國有關. 有沒有辛亥革命, 故事也是一樣變化. 這些引述中的各種言論, 以訛傳訛者有之, 打稻草人者有之, 口不對心者有之, 自以為偉大者有之. 各種古靈精怪的心態, 並列紛陳.